The last time I had to seriously pack was a great many years ago. I used to travel constantly for work, but that was more about travelling light and avoiding creases (suits-in-hotel-laundries-on-expense-account-travelling). This round-the-world business is less about looks and more about bulk – much more like on a walking holiday or backpacking around Europe as a student. Our many trial packs had left me a bit concerned about fitting it all in. Amongst the sea of issues to be dealt with over the last few weeks I’ve been simply avoiding this one by pretending the backpack and the growing pile of things that needed to go in it didn’t exist. Yesterday, that particular ostrich-head got plucked firmly out of the sand. And lo, there wasn’t as much to worry about as I feared. 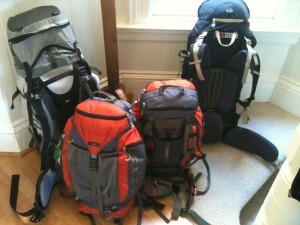 Three things have changed the packing landscape. And the first two are thanks to teachers from the kids’ school. Which just goes to show how useful those teachers really are. If it’s paper, scan it. All the school books and photocopies of activities have now been scanned in and are sitting securely and lightly in the computer. For some reason I can only put down to glaring stupidity I was working on the assumption that the kids had to actually write in the books where the author left a space for writing. Not so explained a teacher in the voice she uses with the slower Kindergarten kids – they can read the book and then write in their exercise books. Getting rid of several kilos of books and their volume has lifted a weight off both mind and back. If it’s cloth, roll it. Fashions move on. Back when I travelled regularly we didn’t have rolling. We had folding, and I was, if I say so myself, a dab hand at folding. Then another teacher asked “Do you roll or fold?”. I was I admit, somewhat, taken aback at the personal nature of the question at first. But then I thought to myself, “We’re selling the house, giving up work, travelling round the world. Let’s really live on the edge. Let’s try rolling.” Like most new converts to a thing, I’m now an enthusiastic roller and am insisting that all my family and friends join up too. If it’s cloth, stuff it. All that rolled stuff fits perfectly in stuff bags. 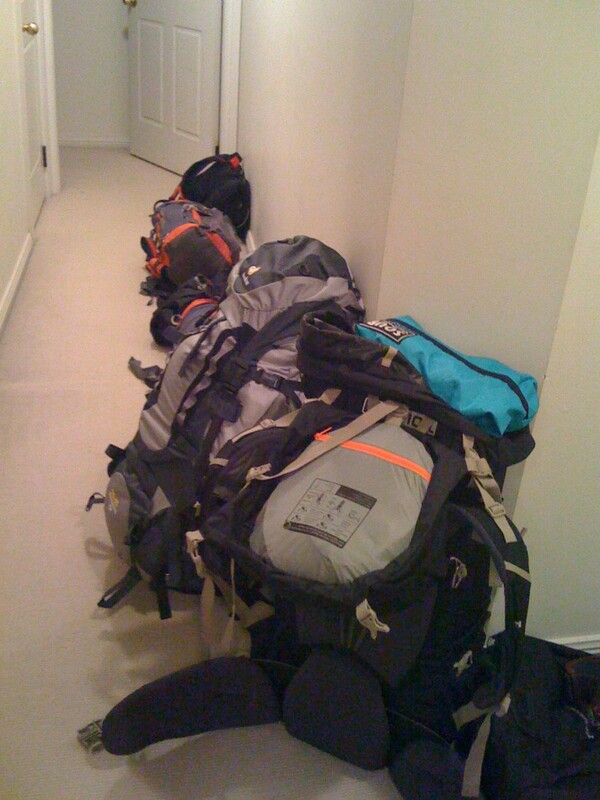 And the stuff bags, because they separate out the packing, allow you to treat the backpack like one very big stuff bag. And I didn’t even have to have a primary-school teacher suggest this one to me. I’m obviously getting into the travelling groove now. Purely out of curiosity — why did you decide only to visit the edges of the US (eastern seaboard & west coast)? No hurry in replying, I know things are crazy for you!